“Dinosaur 13” is “Kramer vs. Kramer” for paleontologists, an absorbing documentary that recounts a torturous decade-long custody battle over the miraculously well-preserved skeletal leftovers of a Tyrannosaurus Rex that were discovered along a remote stretch of the South Dakota prairie. As in the 1979 best-picture winner about a divorced father who fights the judicial system to keep his son, there is a heart-rending relationship at the core of “Dinosaur 13” that is initially one of joy and triumph before it becomes mired in perplexing legalities, grandstanding politics, hurtful accusations and unfair repercussions. Instead of a boy named Billy, there is a T. Rex named Sue–so dubbed in honor of the intrepid excavating volunteer Susan Hendrickson, who first stumbled upon this magnificent specimen one hot August day in 1990. Sue is no run-of-the-mill 65-million-year-old, however. She is the Hope Diamond of dinosaurs, the 13th of her kind ever found as well as the largest and most complete, with at least 80% of her bones recovered. Just to gaze upon this beast’s intact 5-foot-long skull with its fearsome dagger-like teeth puts all the cinematic versions of such prehistoric creatures to shame. If anyone is the Dustin Hoffman of this saga, it’s Peter Larson. Even as a child, this resident of tiny Hill City, SD, who is President and Co-Founder of the Black Hills Institute of Geological Research was driven to dig up Earth’s deepest past for future generations to study and ponder. True, he is a businessman who makes a living by selling these rare treasures, often to international buyers, but when Larson first spied three of Sue’s sun-baked vertebrae sticking through a mound of rubble, it was love at first sight. For 17 days, his small team used picks and shovels in 115-degree heat to free Sue and haul her away for safekeeping at their facility. There, they painstakingly cleaned and restored her for two years, with plans to build a nonprofit natural history museum in Hill City where Sue would be the main attraction. Invaluable archival footage from this period captures such hold-your-breath moments as when workers gingerly separate Sue’s fragile head from her pelvis. But the community’s dreams for Sue quickly crumbled in 1992, after a battalion of FBI agents and National Guard soldiers descended upon the institute. Claiming that the dinosaur was stolen from federal land, officials ordered that she and countless other fossils stored there be seized and carted away to a university in Rapid City that was 30 miles away. There they would sit until a 1995 trial would eventually determine their ultimate fate. But there are a few possible villains lurking about. The state’s grand-standing U.S. attorney. A vindictive judge who took offense when Larson’s defenders tried to have him dropped from the case. The best candidate for Paleontology Enemy No. 1 would be Maurice Williams, a Sioux who owned the area where Sue was found. Larson wrote him a check for $5,000 at the time and they sealed the deal with a handshake. Turns out, it was tribal property held in trust by the Department of Interior. Williams muddied matters more by denying the money was for Sue but to compensate him for having disturbed his land. 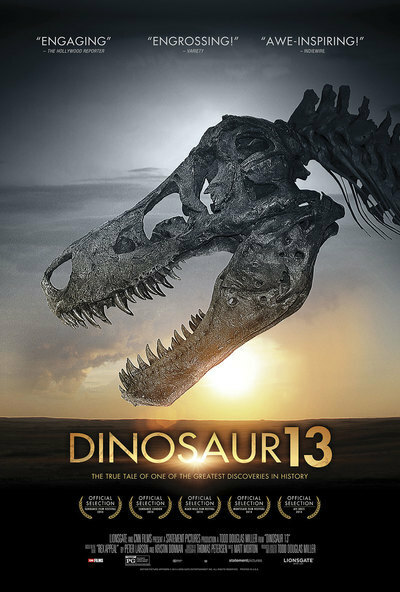 If “Dinosaur 13” has a major flaw, it is how director/producer/editor Todd Douglas Miller over-manipulates our sympathies to root for Larson and his fossil raiders while only briefly acknowledging academics and museum curators who frown upon those who cash in from such ventures. More voices from the other side wouldn’t have done that much damage to his engaging portrait of a man and his dino done wrong. To reveal too many details of this “Law & Order” meets “Jurassic Park” procedural, especially what eventually happens to Sue, sort of dilutes the thriller aspect of the story. I suggest resisting the urge to Google if you plan to see the doc. I did and was glad to be in the dark. But have no worries. The final payoff is indeed the majestic sight of Sue, 42 feet long and 13 feet high at the hip, put back together. While the conclusion may be bittersweet, rest assured that the lizard queen abides.